There are 20 Cirnechi from all the sicilian kennel, the judce is the breed specialist Dr. Dottor Vincenzo Todaro that see in Fiorino the Best Dog and he is 1° exc. in Champion class BOB..! As I said all the sicilian breeders was present with their best dogs and therefore the judge's decision is particularly proud of us! 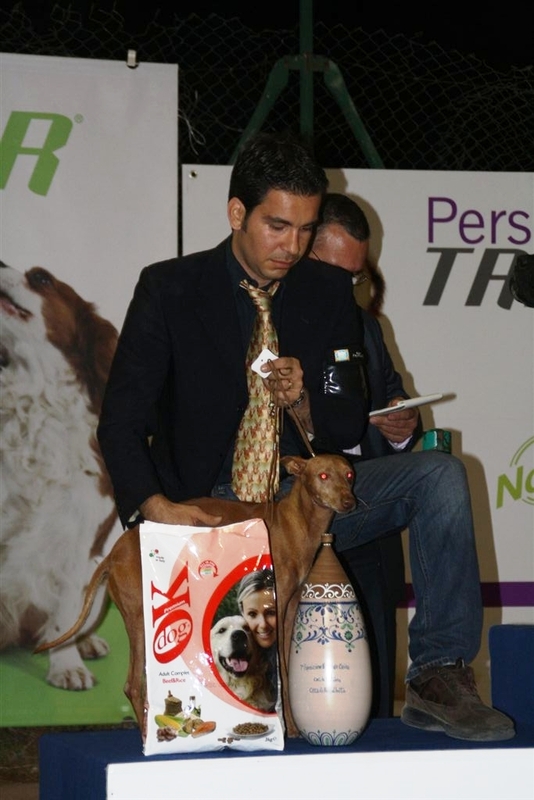 ...continue the successes in the main ring where Fiorino is 2° Best dog of Italian breeds and 2° Best dog of group5..!! ...Fiorino and Mariolà are the Best brace of Cirnechi and the 3°Best brace of the show!! It' was a fantastic night and Fiorino is ever one of the best Cirneco in Sicily...!! Also our Saluki Asia, perfectly handled by our friend Garzia Sardisco, is 1° exc. in open class, Best of Breed and Big 3°..!! With us there is also our Ibizan Podenco "Podi" that is 1° exc. in intermediate class and Bob..! !